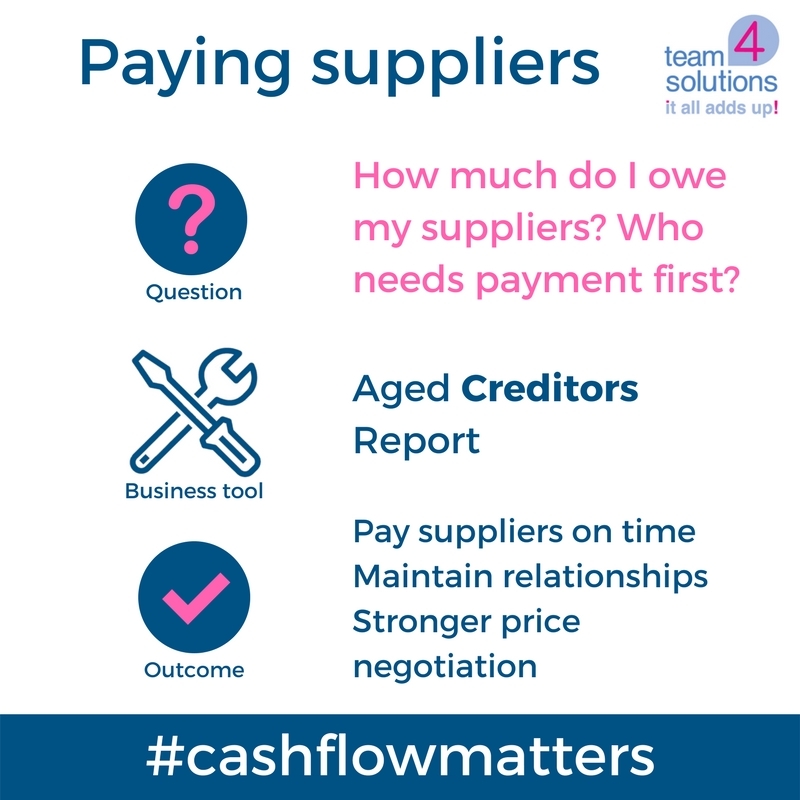 Do you know exactly when all your suppliers need to be paid? … and when you will have the cash in the business to meet all those payments? Or does it feel completely out of control? How much are you committed to paying to suppliers each month? How many sales do you need to be able to pay your suppliers? 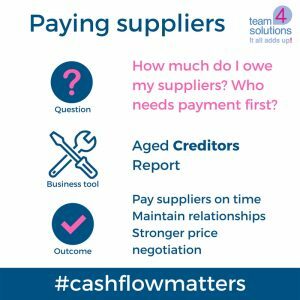 Which suppliers need to be paid first? Are you confident you can meet all your payments over the next 3 – 6 months? You know yourself that being paid on time matters to a small business. Of course this applies to your payments to YOUR suppliers too. Your relationships with your suppliers really matter: it affects how much credit they extend and also your price negotiation with them. Not to mention reliably getting the raw materials you need for your business. How can I manage supplier payments instead of letting the deadlines manage me? The answer is to run a weekly Aged Creditor’s report so you (or your bookkeeper) can plan what money must be paid out when. Laying out your commitments for the next few months means you know what budget you have left for buying goods. It also helps you to understand how much credit you can reasonably offer your own customers. A good bookkeeper can create the report with no fuss if they have access to your financial records. They can then tell you what action you need to take to keep your business running smoothly. As your outsourced accounts department we can check the invoices are correct and flag up any mistakes, as well as managing the payments for you. Don’t sit and worry about it on your own, get some advice from a team who can look at the numbers and know what needs to be done. Give us a call, we know we can help.